Bathurst Heights B&B offers women travellers clean, safe and comfortable accommodation. 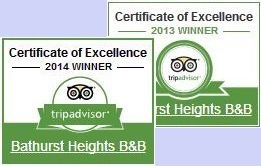 Being a small establishment with only 6 rooms you are assured of our complete attention. Your hosts, Therese and Andrew Wilde, live on site so you we can attend to your needs immediately and regardless of the hour. So if you're traveling for business or pleasure, take the opportunity to stay where there are quality facilities, a relaxed atmosphere and all the ingredients for a great nights rest.